The kidneys filter blood to eliminate waste products and excess water that are excreted in the urine. A drainage system carries urine from each kidney to the bladder where it is stored until emptying is appropriate. Each kidney drains into a renal pelvis, which funnels urine into a ureter, the long, narrow muscular tube that conducts urine to the bladder. A ureteropelvic junction obstruction is a partial blockage of the connection of a renal pelvis with the ureter, the ureteropelvic junction (UPJ). This impedes drainage and causes urine to back up in the kidney leading to increased pressure, flank pain and, in some cases, kidney damage. Imagine a partially clogged sink drain: when water is running slowly, drainage is adequate, but when water is flowing more rapidly, it backs up. Most often, this blockage is the result of an abnormality of kidney development occurring prior to birth (congenital). The muscle of the obstructed ureteropelvic junction is poorly developed and, sometimes, replaced with scar tissue. Both kidneys are involved in 10% of cases. In some, the obstruction may have occurred after an injury or inflammation related to a kidney stone. Occasionally, a blood vessel crossing over the UPJ can contribute to blockage. UPJ obstruction may be diagnosed at any age. Routine ultrasound during pregnancy can detect fullness of the fetal renal pelvis (hydronephrosis). Some infants are found to have UPJ obstruction when abnormal swelling in the abdomen or flank is discovered or urinary infection develops. In adults, it may be identified during the investigation of intermittent flank or abdominal pain often made worse by drinking large volumes of fluid. Some patients develop bloody urine or stones in the affected kidney. Once UPJ obstruction is suspected, investigations are required to determine the exact site and severity of the blockage. Blood and urine tests assess overall kidney function and the possibility of infection. Imaging studies are used to clarify the drainage system anatomy and assess the degree of obstruction. Ultrasound or CT scan will show fullness in the renal pelvis and any loss of functioning kidney tissue. Intravenous pyelography (IVP) involves the injection of contrast material into a vein followed by a series of x-rays. The “dye” is excreted by the kidneys outlining the drainage system and gives an indication of function. A nuclear renal scan can evaluate kidney function more accurately. In some cases, a diuretic is given during the scan to promote increased urine production. The scanner will show increasing nuclear marker buildup in the kidney in the presence of obstruction while the marker washes rapidly out of a normal drainage system. We may recommend a cystoscopy and retrograde pyelography. This involves passing a narrow visualizing instrument (scope) through the urine passage (urethra) into the bladder. The kidney drainage system is then filled from below with x-ray dye to allow detailed x-ray imaging. The degree of blockage may vary from minimal to severe and, occasionally, it may come and go. In some cases, particularly in infants, UPJ obstruction may be mild and not require any treatment. Unless very severe, UPJ obstruction found in newborns often can be safely observed without treatment because, frequently, the blockage will resolve on its own as the child matures. We will recommend periodic monitoring with lab tests, ultrasound and nuclear kidney scans. A small daily dose of antibiotic may be advised in newborns to prevent urinary infection that could damage the kidney. Treatment may be required when symptoms are bothersome or kidney function is impaired by the obstruction. In some, temporary kidney drainage can be obtained with an internal or external drainage tube. 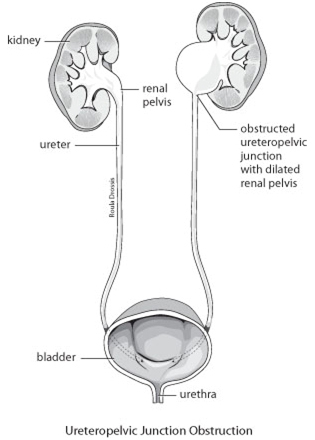 A ureteric stent is an internal drain running from the renal pelvis to the bladder within the ureter, while a nephrostomy tube drains from the renal pelvis out through the flank into a bag. This can allow treatment of infection, preservation of kidney function or relief of pain while corrective surgery is being planned. Surgery aims to reconstruct a gradual tapering of the ureteropelvic junction to allow unobstructed flow from the renal pelvis to the ureter. Various surgical techniques are available to correct UPJ obstruction. We will recommend the procedure most suitable to your specific circumstances. Traditionally, UPJ obstruction has been repaired with an operation called apyeloplasty. Under general anesthesia (one is “put to sleep”), an incision is made in the flank through which the renal pelvis and ureter are exposed. The narrow UPJ is cut out or cut open after which a wider connection is constructed. A temporary stent or nephrostomy tube may be placed. Patients may be in hospital for up to seven days and able to resume their usual activities within four to six weeks. This operation is successful in about 90% of cases. Today, it may be possible to perform a laparoscopic pyeloplasty. A series of “keyhole” incisions are made in the abdomen through which a narrow video camera and operating instruments are used to reconstruct the UPJ. This operation, although technically challenging, may allow a shorter hospital stay and recovery time. Another alternative in adults is endopyelotomy, which involves making a cut through the area of obstruction in the UPJ using a scalpel, electric current or laser passed into the drainage system through a “scope”. In a percutaneous endopyelotomy, a small incision is made in the flank through which a scope is advanced through the kidney into the renal pelvis to incise the UPJ. Ureteroscopic endopyelotomy involves passing a scope through the urethra, bladder and ureter to incise the UPJ. With either approach, a stent is required for several weeks postoperatively. These techniques may not be possible in all cases and have a success rate of about 70-80%. If the kidney has very poor function, we may recommend its removal (nephrectomy) rather than repair. After UPJ obstruction is treated, follow-up can ensure that the affected kidney is functioning properly. This may involve periodic blood and urine tests, ultrasound and nuclear renal scans until it is clear that the problem has been corrected.